“‘When We All Fall Asleep, Where Do We Go?’ traces a clear arc: from bravado to melancholy,” Jon Pareles writes about billion stream pop sensation Billie Eilish. “I can’t even tell you how anxious I’ve been to get this album out,” Eilish told culture reporter Joe Coscarelli from her parents’ tiny kitchen earlier this month. “Eilish writes and records her songs with her older brother, Finneas O’Connell, working largely at home,” Pareles reports (“Billie Eilish Redefines Teen-Pop Stardom on a Haunted, Heartfelt Debut Album“). Maggie Baird and Patrick O’Connell, once hopeful actors with their own stardom dreams, are a constant presence helping even more ambitious dreams come true for son Finneas and daughter Billie Eilish. Credit: Magdalena Wosinska for The New York Times. Near the end of her debut album, the 17-year-old turns to themes of grief, suicide and loneliness; familiar experiences for some of the pop star’s biggest fans. Many South Florida youth continue to struggle from the traumatic events of February 14, 2018, when a former classmate murdered 17 students and staff at Marjorie Stoneman Douglas High School in Parkland. April 20, 2019 is the 20th anniversary of Columbine. This month, two teenage survivors of the Stoneman Douglas shooting took their lives. The father of a youngster killed in the 2012 Sandy Hook elementary school shooting in Newtown, Connecticut did too. Those tragic stories made headlines. Few know anything about 4,000 other Americans who took their lives in the last month or thousands more contemplating suicide this very moment. While Eilish’s more melancholy songs focus on the grief and loneliness felt by many in an America where suicide is a leading cause of death for teenagers, her life itself may point to the solution. Surprising to many, her real superpower may not be her voice, but her close family. 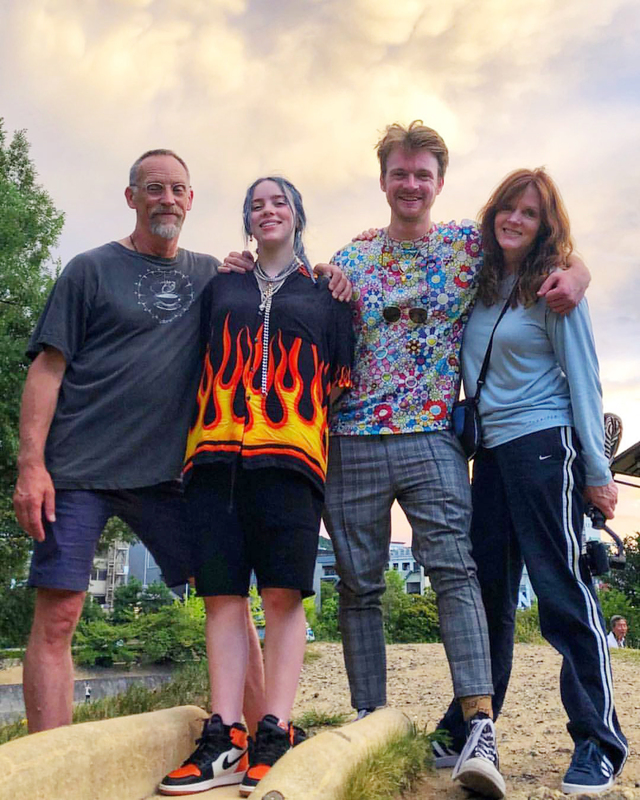 Billie Eilish Family: Patrick O’Connell, Maggie Baird, Billie Eilish, Finneas Eilish (Twitter). “Our closest relationships can be life saving,” said Seth Eisenberg, CEO of nonprofit Purpose Built Families Foundation in Pembroke Pines, Florida. “For many, relationships with family, friends and social supports are the best defense against loneliness, grief and depression, yet as a society our focus is often pathologizing, diagnosing and treating symptoms instead of helping resolve the underlying deprivation of meaningful human connection,” he said. Eisenberg said Eilish can do a lot of good showcasing a strong family to adoring fans. Two decades of experience serving people impacted by trauma, including thousands touched by homelessness, poverty and the invisible wounds of war, leaves Eisenberg hopeful about the future. “Whether those lessons come from a classroom, training or the inspiring family of a pop star like Billie Eilish, learning to create, sustain and protect close relationships is our best hope for a safer, saner, more loving world,” he said. The National Suicide Prevention Lifeline is 1-800-273-8255. Other international suicide helplines can be found at befrienders.org. You can also text TALK to 741741 for 24/7, anonymous, free counseling from the Crisis Text Line.